When new girl, Mikoto Urabe, arrives in Akira Tsubaki’s high school class things start to get weird. Soon Akira finds himself in a relationship with the mysterious Urabe. 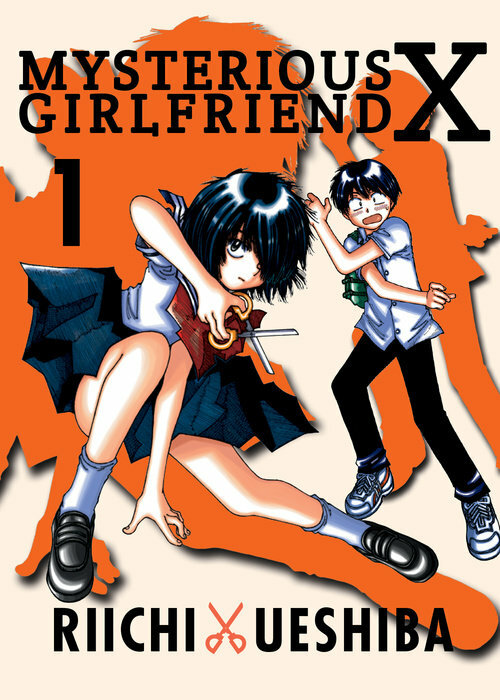 From Riichi Ueshiba comes the adult romantic comedy, Mysterious Girlfriend X, Vol. 1, the manga behind the 2012 anime series of the same name. If the first volume is anything to go by, then Mysterious Girlfriend X, Vol. 1 is a fairly straight forward tale of young love and the awkward excitement that comes with a first relationship. Throughout the volume Urabe and Tsubaki grow closer, spend time with each other as their relationship slowly develops. This isn’t really new ground, there are many series that follow a similar premise. What really sets Mysterious Girlfriend X apart is the twist. In one stomach turning moment, Tsubaki’s relationship with Urabe begins when he decides to basically lick her drool off of a school desk. Apparently Urabe’s drool is akin to heroine and Tsubaki quickly finds himself jonsing for more as he suffers withdrawal symptoms. Urabe realizes what he’s done and that’s basically the framework for the series. It’s not just a weird hook, but also a metaphor for their feelings and desires for each other, sexual awakening, the feeling out process and more. The drool isn’t just a weird one off hook, it’s a constant in the series and nearly every chapter features a scene of Urabe feeding it to Tsubaki in what becomes a rather repulsive ritual. While the idea of swapping spit isn’t really shocking, it happens every time people make out, licking and sucking it off a desk or off of someone’s finger is pretty nasty. The artwork doesn’t help matters. The drool is usually thick and sticky and seems to resemble another type of bodily secretions, reinforcing its nature as a sexual metaphor. Despite these gross moments, Riichi Ueshiba’s artwork is actually pretty fantastic. He crams detail after detail into each panel, resulting in a wonderfully realized and grounded world for the rather weird love story. There’s a great sense of weight and texture to the work, the character’s winter clothes look heavier and warmer, meanwhile the city backgrounds have a lived in feel to them. There are a few weird dream sequences which is where he really gets to flex his muscles by creating huge, sprawling splash pages or two page spreads featuring a dream world crammed full of interesting looking figures and buildings and signage. This is all a welcome change from the many other romantic comedy series which often take place in a white space devoid of everything but passing clouds of toning. Gifted with some solid comedy and relationship building, not to mention some really great artwork, Mysterious Girlfriend X, Vol. 1 is tainted by it’s drool gimmick. It’s including interrupts and derails what would be an otherwise perfectly acceptable romantic comedy and even it’s symbolic meaning doesn’t detract from how nasty it is. It’s inclusion feels like a shock tactic done to attract attention, which is a shame because it’s detracts from a pretty de cent read. Mysterious Girlfriend X, Vol. 1 is available now from Vertical Comics. Review copy provided by the publisher. Categories: Manga Reviews, Reviews Tags: Mysterious Girlfriend X, Riichi Ueshiba, Vertical Comics, Vertical Inc.